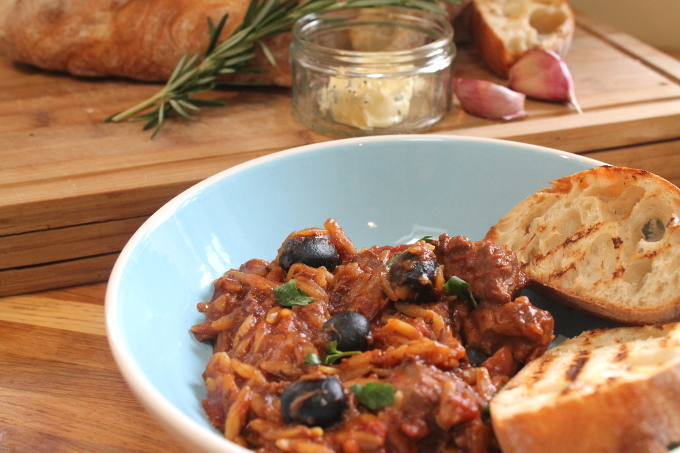 A delicious and warming slow cooked casserole. 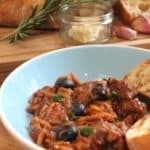 The lamb and orzo are cooked in the same pot making this dish super easy with little washing up to do afterwards. I think you’ll all have gathered my now that I’m no fancy schmancy cook. Although I’d love to spend hours in the kitchen cooking up impressive new dishes, with two small kids I just don’t have the time. Cooking dinner often involves turning the oven or hob on and off several times so I can deal with a nappy explosion, an emergency feed or a temper tantrum. And that’s why I absolutely love slow cooked one pot meals. I can prepare dinner earlier in the day when my oldest is at nursery and the baby is napping and then leave it to cook. Another reason I love slow cooking is that you can use relatively inexpensive cuts of meat. I really would recommend buying these cheaper meats from your butcher as they tend to have a lot more variety than the supermarkets. 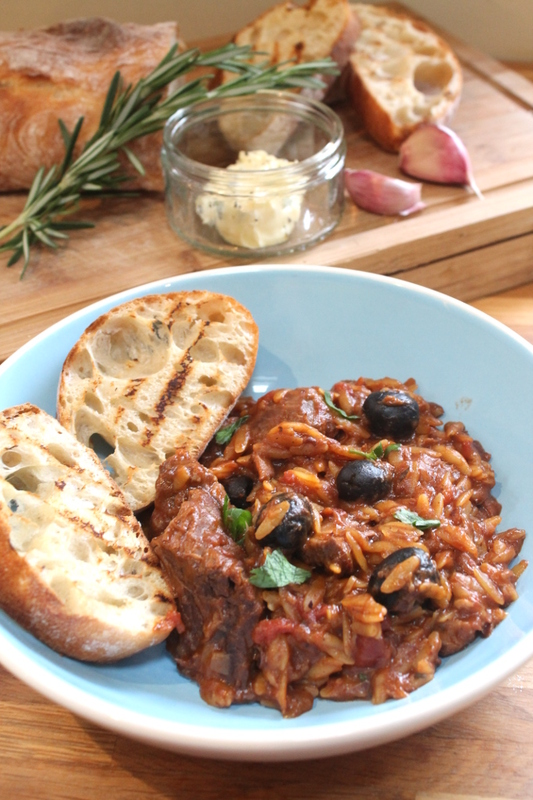 You don’t often see casseroles served with pasta but the small grains of orzo work really well in this dish and soak up all the beautiful flavours of the lamb and herbs when cooking. My fussy eating family gobble this dish down every time I make it. It also keeps really well in the fridge if you want to make extra to have for lunch the next day. 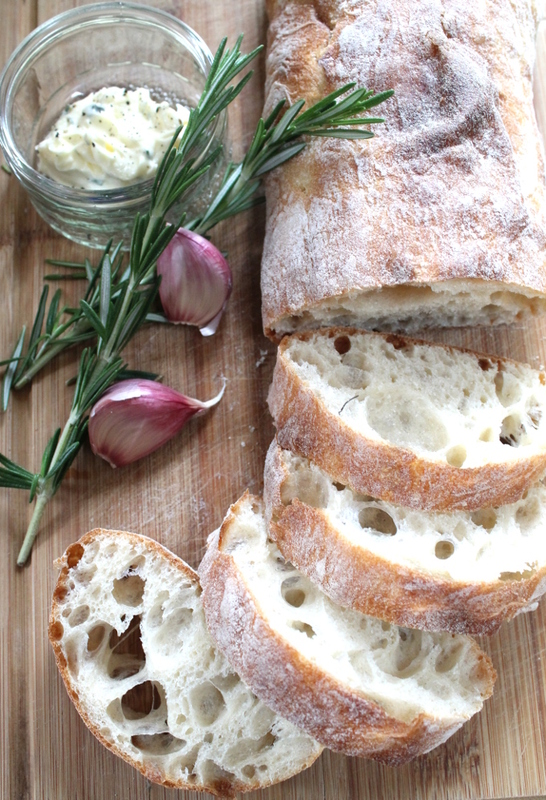 Serve with this easy garlic and rosemary ciabatta bread. If you have some leftover ciabatta, don’t let it go to waste. Make this delicious Parmesan Bread Pudding. Dust the lamb chunks in flour spread onto a plate. Heat the olive oil in a heavy bottomed casserole dish and fry the lamb in batches of 4 or 5 pieces until browned all over. Place the browned lamb in a bowl and keep to one side. Lightly fry the onion, garlic and cinnamon stick (add more olive oil if necessary) for 5 mins, stirring regularly. Add the bay leaves and oregano and cook for a further 2 minutes. Add the chopped tomatoes, stock and wine if using. Scrape the bottom of the dish with a wooden spoon to release the frying flavours. After a minimum of 2 hours take the dish out of the oven and remove the cinnamon stick and bay leaves. Add the orzo. 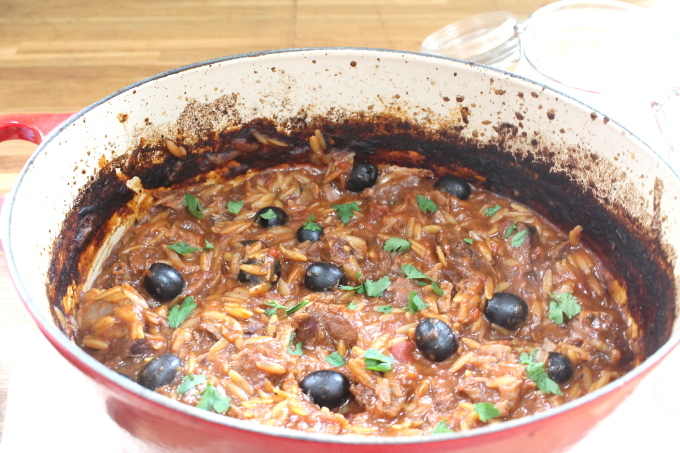 The sauce should still look quite runny at this stage but the orzo will soak it up. If the sauce is looking too thick you can add extra stock or wine. Return to the oven for a further 15 minutes. Add the black olives and return for a final 5 minutes in the oven. Gently dry fry the ciabatta slices on a griddle pan for 1-2 minutes either side. Make the herb butter by mixing the garlic and rosemary in with the butter. 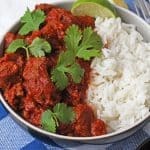 Thanks for this recipe, have made it a few times now and it’s always delicious and enjoyed by adults and the baby. My son doesn’t have many teeth so the slow cooked lamb shoulder is a good option for him as it breaks up easily. I once accidentally made this following a recipe on another site and it wasn’t very good, so always check my bookmarks now! Thanks Sue, so glad you enjoy it! 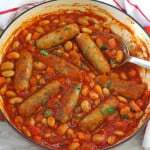 Can you make this recipe in the slow cooker? Sounds delicious and would love to try it, in my slow cooker? Made this when we had friends coming over for dinner and it went down an absolute storm. Loved how easy it was to put together and also the fact I could just leave it alone and get on with doing other stuff. Lovely. 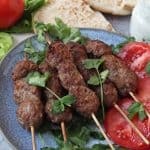 This is a fantastic recipe, really easy to follow and tasted delicious! I used mini pasta shells instead of the orzo as my local supermarket didn’t have any orzo and it took slightly longer to cook but I didn’t mind. The lamb was just amazing…..melt in the mouth stuff! Yum….will def be doing this one again.